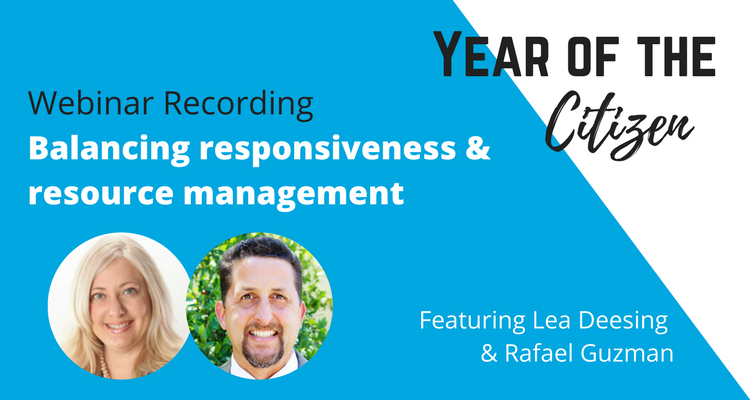 Last month we sat down with Riverside, California’s Chief Innovation Officer Lea Deesing and Director of Community & Economic Development Rafael Guzman to talk about their strides in customer-facing technology. With an innovative ‘ecosystem’ of online services, Riverside, CA is a nationwide leader in providing customer-centric tools and platforms for their residents and visitors. Having spent many years working in smaller communities, Deesing and Guzman also share their insights for improving customer service and technological innovation without breaking the bank. Watch the entire webinar here or watch the segmented sections below to learn more about improving the state of technology and customer-service in the public sector. A 24/7 virtual City Hall means offering all possible in-person services online, and the services are being used! Start be taking inventory of your data — what do you have access to right now?